I'll miss the heat and press of other bodies when I am dead. I used to hate large crowds. Now I seek them out. I love being surrounded by thousands of other faces, and knowing that each one conceals a story at least as rich as mine. Some bear a trail of history. Others project potential. There's something intoxicating about it. The susurrus of so many conversations in which I'm not obligated to speak. The sea of pheromones broadcasting excitement, attraction, aggression - glands pumping out vapors to so many lizard brains. And the subtle expressions of faces, even as so many of them are cast downwards towards phones. Really, in all of time and space, how rare is it for this many people to converge so closely together? Most of the planet is uninhabited. And there are not enough zeroes to the right of the decimal to convey the bleak empty state of the universe. A few thousand years back and it's even bleaker. Who knows what the future holds? But right here, right now - hearts pumping, neurons firing, bodies maintaining temperature against the cold. What kind of strange miracle is that? 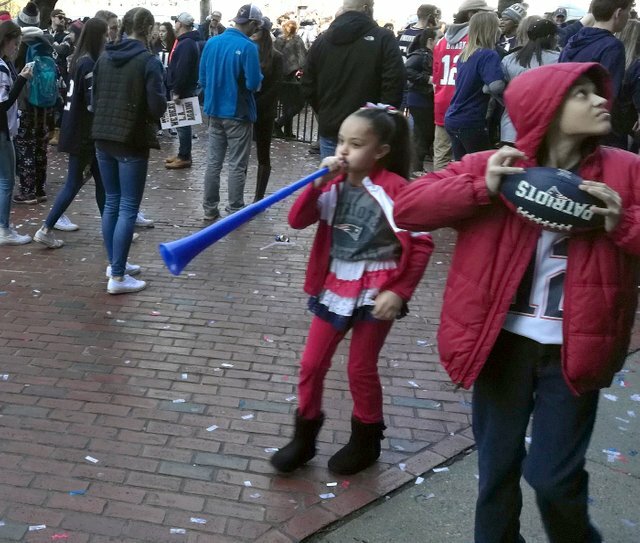 On Tuesday, Boston celebrated the New England Patriots win with a massive rally downtown. 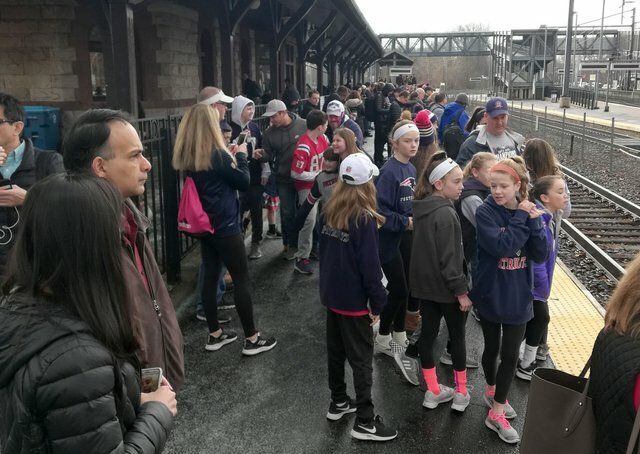 I could care less about football, and when I saw these crowds in their football jerseys and branded hats waiting on the train platform during my commute to work, I knew I was in for a challenging ride. Not only that, but these parades pass directly by my shop. However, instead of getting aggravated, I found myself carried along by the tide of excitement. When people are this excited about anything, it's more fun to appreciate their passion, even if the object of that excitement might be absolutely bewildering. 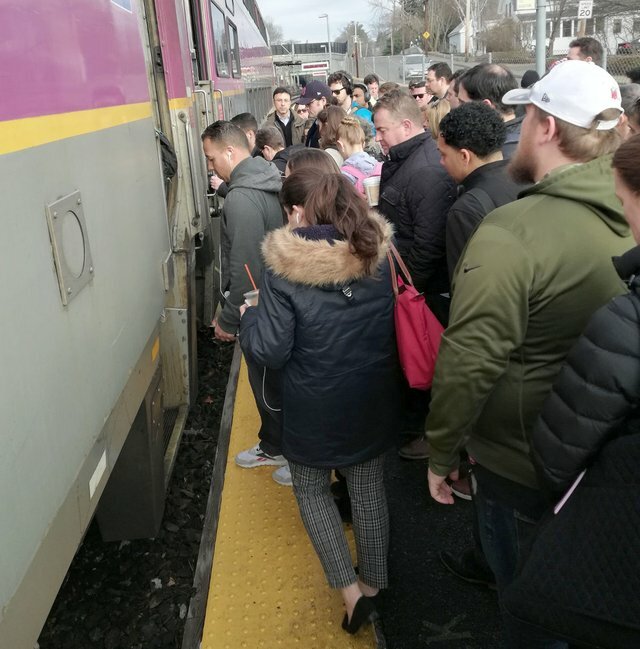 It turned out to be the busiest day in the history of the commuter rail. The unseasonably warm weather contributed to this. 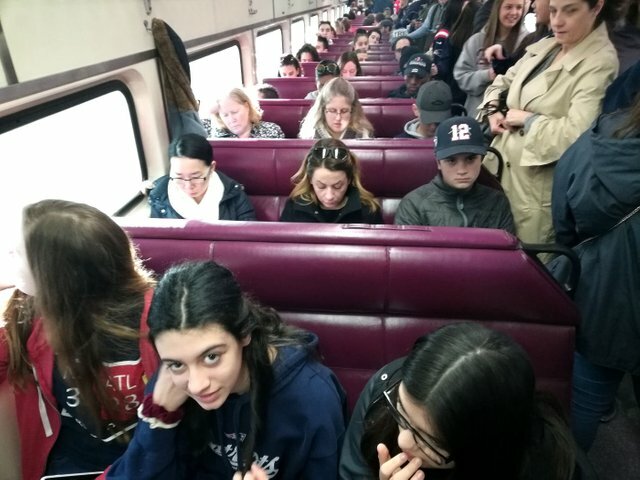 There were more than twice the usual number of passengers. Further slowing things down were a fatal train strike in the morning, and a derailed train on the green line. The day was so full of artistic and passionate moments that had nothing to do with football. I suspect that a lot of people were there for similar reasons. There was lots of underage drinking and cut classes. We had a woman come in and ask to use the bathroom. It's not really fit for public use, but I guess the boss took pity on her. Here's the line at the public restroom next door. Our visitor wound up falling down a stairway and knocking over a display of cigar boxes. Getting out of the city was another challenge. 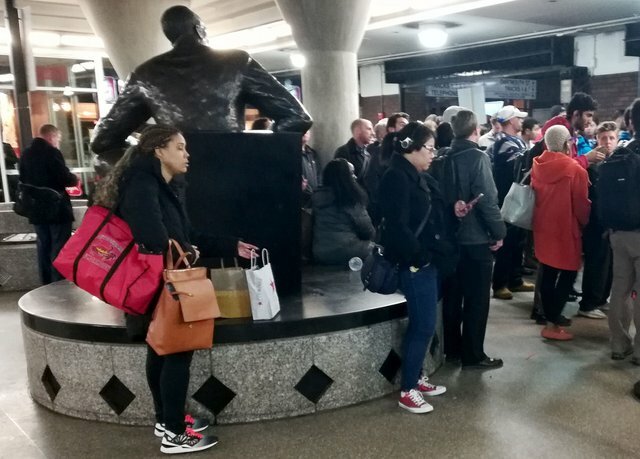 North Station was so overloaded that people waited for an hour in lines outside the building. I was taking a different line that day, and commuting out of Back Bay Station on my way to see my buddies in the Sherlock Holmes Pipe Club. 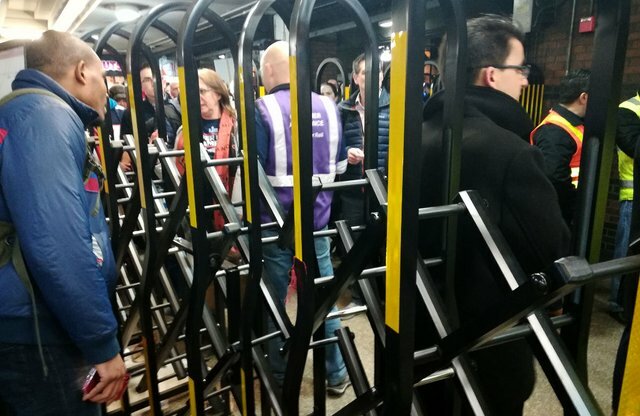 When I got there, the station was festooned with gates to hold back the crowds. 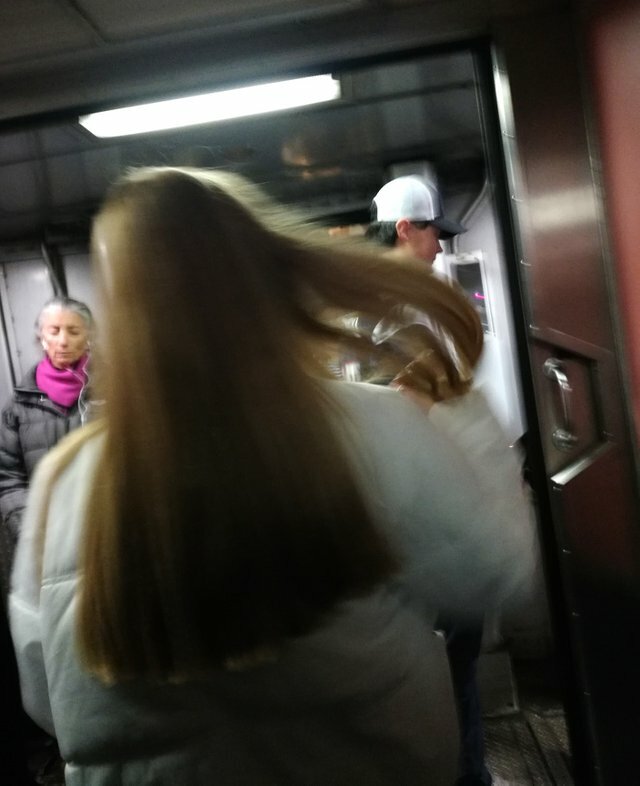 MBTA staff and Transportation Police were announcing each coming train with bullhorns, and letting passengers through only when the platform below was ready for them. It was such a primitive system, like something in a newsreel about the third world. I've never seen anything like it. 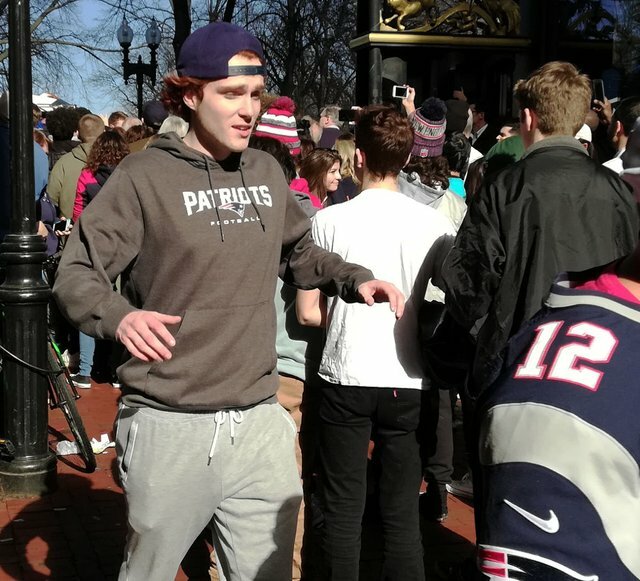 Meanwhile, a bunch of drunks were chanting "Where's our train? Where's our train?" I wanted to say, Maybe if you shut up for a minute, they'll tell you. 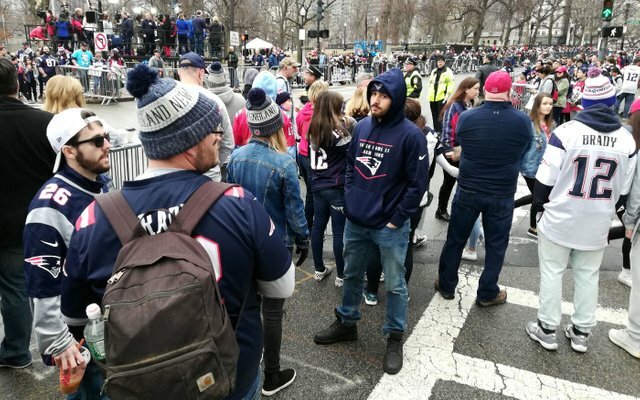 A woman next to me was muttering on and on about how they were letting too many people through. 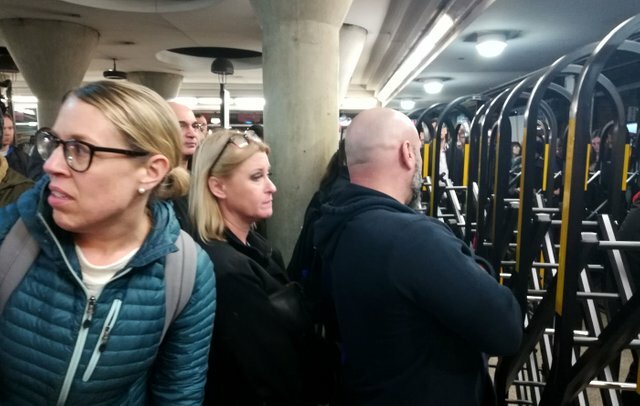 "The trains can't hold that many people," she said. She was wrong. You can pack a lot of bodies into these tin cans. Eventually I made my way through. A woman walking in the opposite direction, up a stalled escalator, lost her balance and landed upside down. She shrieked and cried with her feet in the air. 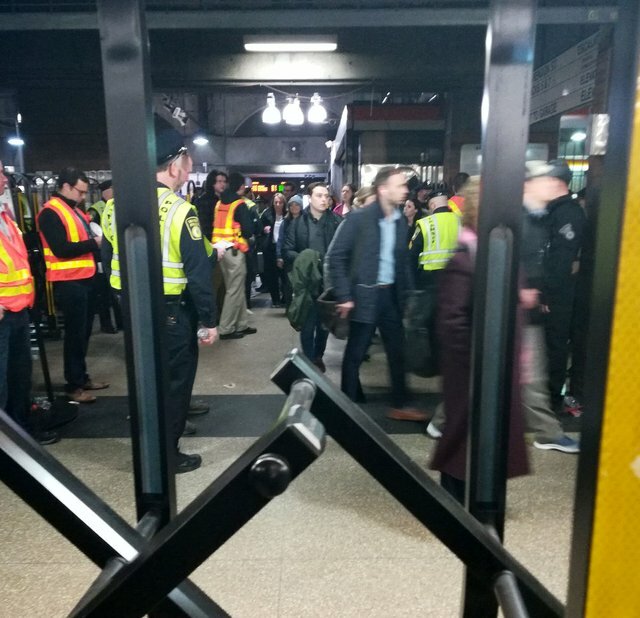 I felt guilty walking past, but there were already too many people around, trying to lift her up again, and yellow-jacketed Transit Police were racing to the scene while others exhorted us to keep moving and get on our the train already. I packed in again. I actually got a seat, next to a young man with some luggage tagged from Logan airport. He told me he'd arrived that morning, from the Super Bowl in Atlanta. We listened to a conductor lecturing some kids about fare-skipping. "I sit with these riders every day, and they pay over $300 for their passes. Why should they subsidize you?" She was stern and hilarious at the same time. She got applause from the rest of the car. It's always a joy to witness someone who's good at their job, whatever that job may be. Once through the press that disembarked at Canton Junction, the world seemed suddenly dark and empty. 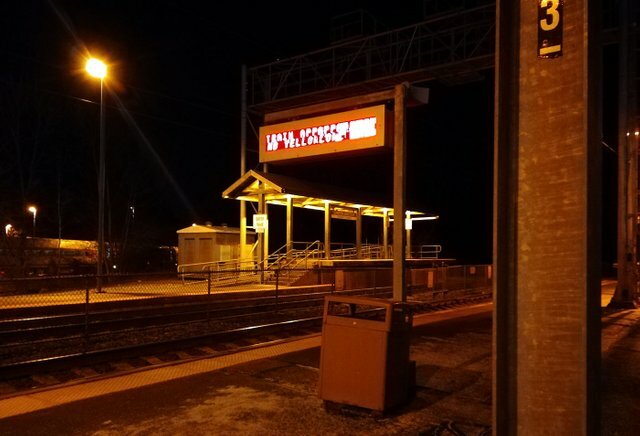 The "Train Approaching" warning sign was tired and worn out, dissolving into electronic noise on the right side. I hastened to my meeting, where I smoked pipes with some old friends. I may be an introvert and a misanthrope, but I still hold that it's a grand old world that has so many people in it. Yeah. We'll miss this place someday. "Now" is the envy of all of the dead. Unless otherwise stated, photography is the work of the author. Feel free to copy, remix and share photographs from this post according to the terms of a Creative Commons Attribution Sharealike 4.0 International license. Camera divider and signature illustration by @atopy. If you'd like to read more, you can check out a categorized catalog of my posts on Steemit here. You make a normal day to sound so special and thoughtful in this post. You should really write a book, Winston. Or at least a short story, I think it would be wonderful because your way of thinking and describing and putting stuff together are charming. And I'm not sure if I will ever find a throng of people around me to be pleasant xD. Thank you @scrawly. What a nice compliment. You make me want to write a book. I have done a bit of fiction writing. I have a story on Steemit over here. But for some reason I just find non-fiction/essays so much easier these days. Maybe my imagination's broke? I saw that girl in the top photo in your other post, too. You're right, she definitely caught you.